Tuesday and the club has got back together after the Christmas recess. Not too many turned up and only a few games in play. 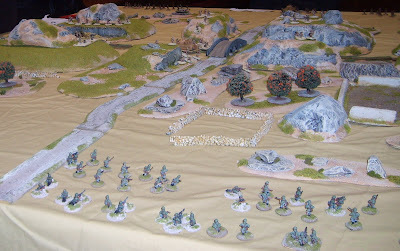 Martin was once again trialling a battle for his scenario book for Cheer Boys, Cheer! and, like last time, was short of terrain as the club owns no wide hills, barring a couple of foam ones, for making valleys. 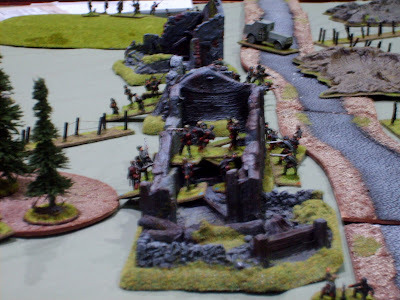 The Rebels were starting to get a bit worried as the Blues crossed the river unopposed except for the cannons which themselves were coming under counter-battery fire from the Union positions on the far side of the river. This was pretty ineffectual due to the fortifications. Finally got roped into doing DBA for the first time in a mini tournament with six players. A round-robin with each game was nominally twenty minutes each. Armies were randomly allocated from Paul's central collection of plastics and I ended up with the Sea People, who were apparently half Viking - half Village People. 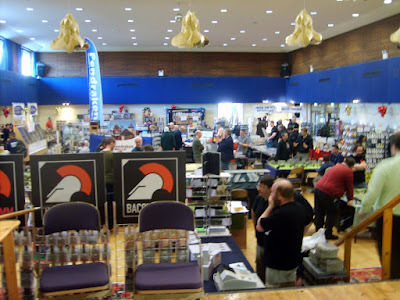 Had nothing better to do on Saturday so went on a trip to the land of Tykes and journeyed to Recon, one of the smaller conventions, and organised by the Wakefield and Ossett Wargamers, being held in (or rather outside) Pudsey. Went the scenic route via Settle before hitting the nightmare that is Bradford traffic system. 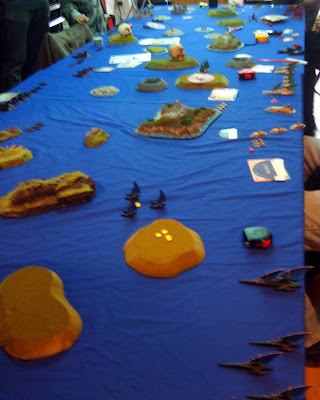 At a loss for games on Tuesday, didn't fancy a small DBA tournament, set in what looked like Egypt judging by the pyramids and sphinxes, and the Uncharted Seas game was already full. Didn't bring my usual selection of games and unfortunately everybody thought likewise so we were sort of stuck at what to do. Craig normally brings something along but as he hadn't currently arrived, it was decided to do the 'summon Craig ritual' and send me out to get my games. True to form the ritual worked and by the time I got back Craig was there setting up a game of Formula D (De as was). Use to play this game enough in the past (with Jon, Ray and Ian) to actually have full World Champions and running two cars each, but this is the first time playing the new version. The new version has flashier components than the old, with peg based dashboard rather than the paper and pencil pads formally used. The cars look smaller than previous and are one piece but coloured rather than the old with their clip on wings which you could mix and match. The race was a two lapper on a proper racing circuit (Hockenheim) rather than one of the gimmicky street racing ones included in the new version. Six players racing one car each. Didn't get off to a good start, taking two collision damages in the first third of the track and leaving most of my tires on the tarmac. Everybody bar Craig headed into the pits at the end of lap one, and being within a turn of each other a large tailback ensured. Not sure that the pit rules were done properly as I didn't think you could stall in the pits; either fast or slow stop and out in Fourth gear (or lower) regardless of the pit roll. Another new thing in this version is the limited ability to fix two damage to other areas of the car as well as renewing the tyres. More carnage going around the second lap but not from my car. Jim's Tractor ended up falling apart half way round the second lap with Keir's soon to follow. Did manage to use up all my tires and brakes to just survive the last corner, and putting myself one step ahead of my rival for third\fourth place. Thought I had blown it at the end as I rolled one short of the finishing line, but thankfully the guy behind was just as bad at rolling the die as I was and came up two short of the line. So staggered across the finish line in third. 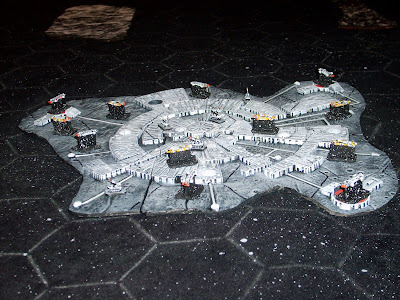 A Steam-punk\Victorian Sci Fi mini campaign set out in the asteroid fields, which apparently are filled with independent Cornish miners and the fleets of the Great (and not so great) Powers which are trying to take over. Asteroids are spread out at roughly two to three hex intervals, making a merchant\supply ship with your fleet essential if you need to hop quickly from one to another. Poor Spain nearly got knocked out early, becoming the victim of the first battle, and ended up with all their asteroids captured by others leaving only 'a ragtag fugitive fleet' of destroyers and merchants floating in neutral space. Maybe an idea for a TV series there. Unfortunately this gave the Italians a number of captured ships, including a battleship. Everybody else is slowly heading towards the victory condition of 6 out of the available 19 asteroids. 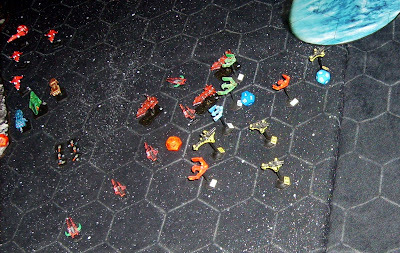 Matt moves his fleet into the same hex that I've just captured in an attempt to hold him off, having to give up one of my hexes to move there. It's an even fight, both of us having a Battleship, Fortified Cruiser and a Merchant, but some bad rolls for damage control doomed my ships after the first exchange of fire. So the Italians end as the dominant force in the asteroid belt, which might make up for getting kicked around in Africa. Set somewhere in Poland sometime in 1915 during a period of fluid warfare. Played with Warhammer Great War, the Russian list is unofficial as the supplement covering this area is a long time delayed. 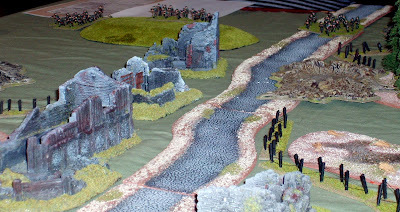 Both Germans and Russians are given the same objective, take control of the ruins in the centre of the table. Shell-holes and barbwire was set up by the players without knowing entry points. The Germans got a captured Russo-Balt Armoured Car to play with, scratch built by Dave M; again no official rules for this type so guesswork involved. Not as good as the ones the British get to play with. Reinforcements are available based on die rolls at the start of each turn. The AC rushes, or more like tootles at 9" rough and 12" on-road, down the road towards the enemy in an attempt to slow their advance, and maybe give the German troops enough time to get into position. The Russian Infantry ignore the Car, not even attempting to swarm it. 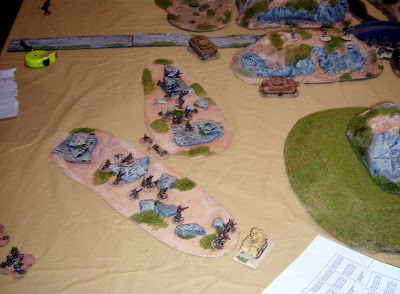 Instead they set up their HMG and after a couple of bursts destroy its forward MG and then the Car itself. 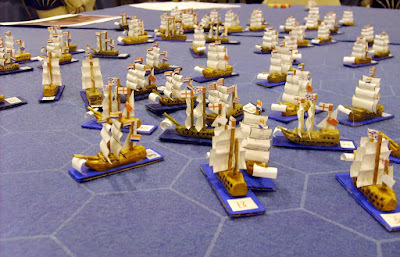 Questions were asked over the mobility of the HMGs as according to the rules, once setup they should remain in place for the rest of the game. This would of left the Russian MG blind to the rest of the battlefield so implemented a couple of turns delay and then allow it to move again. Assault on the main ruins. Both forces arrived in consecutive turns but it was the Germans who launched an assault, should Russians have got cover save as both forces were internal to the building. 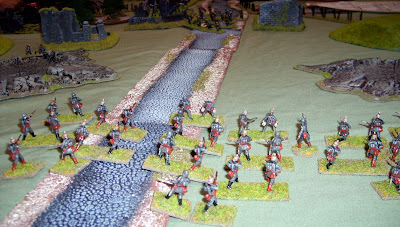 Germans soon become out numbered as extra Russian troops pour in. 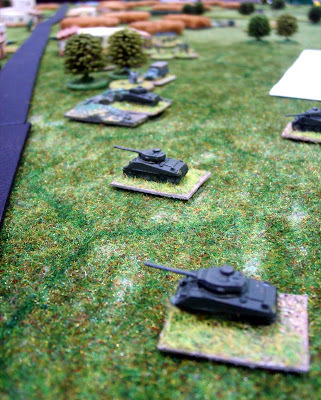 Forces in woods not particularly well protected as both platoons resident there get chipped away. Russian Mobile reinforcements turn up. Three Armoured Cars, Two Russo-Balts making their way past the wreck of the German vehicle, and a Putilov-Garford reversing to try and get it's rear-mounted gun into action. Additional German troops finally turn up and advance towards the centre, managing to wipe out a platoon of Russians who were pursuing the survivors from the big melee. Unfortunately this wasn't enough to take the victory away from the Russians, who dominated the centre. 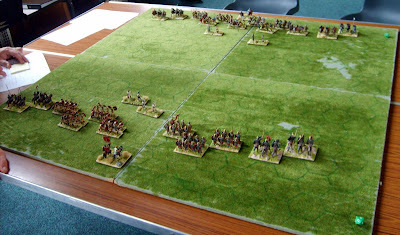 Things might of played quicker if the forces were entering on the long edges rather than having to move across the table. It took a number of turns till any action happened as the forces tried and close on each other. Prior to the battle there was reports of a strange unidentified object floating overhead. Apparently its green skinned inhabitants had got confused over the date of the big space battle, turning up a week late or centuries early depending on your time-frame. 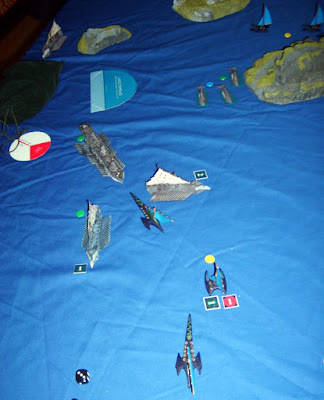 Its big battle time as the heavyweights from various fleets move into the contested region, which is also currently being visited by a certain free-roaming moonbase. Once again it's 'Good guys' vs 'Bad Guys'. 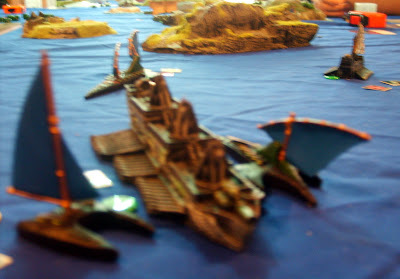 All ships and terrain from Geordie Paul (not LaForge). Best of three capture, two planets and the base in between being the objectives. 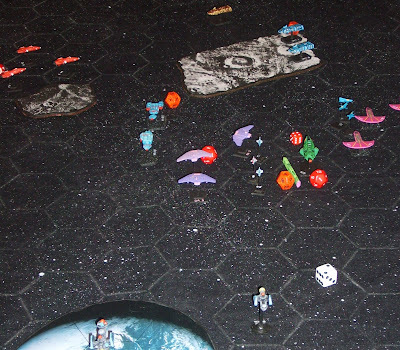 The 'good guys' reach the moonbase first and enlist their help against the oncoming hoard. 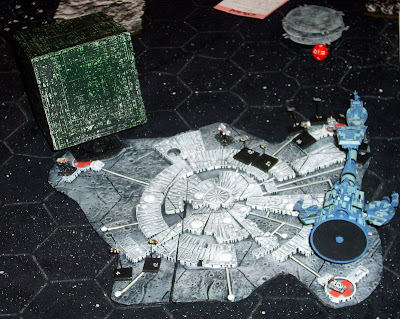 Not that it did the base much good as waves of Cylon Raiders destroyed nearly all the Eagles and Hawks newly launched from the base. Even worse, The Borg Cube decides to do a bit of grazing, assimilating part of the base and repairing itself in the process. This damage was caused by the wave gun from the blue ship sent to protect the base. The Blue Battlestar and friends suddenly work out that the Klingon is almost impossible to hit due to it's speed boost from its elite crew. Even combining weapons only gives a slight chance of doing light damage. Both available versions of the Enterprise head to engage the Cube after easily dealing with the two Shadow craft. The Wave Gun gets lucky and recharges straight off (a nice 6 on the die) and lines up for another closer ranged shot at the giant Oxo cube. 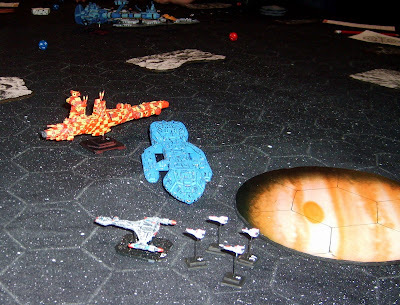 At this point the game was called, with the general agreement that the bad guys were going to lose, as the combined power of the ships present should take out the already chipped Borg, leaving only the Klingons and Cylons contesting a single planet. My elves were put on the left flank and given the job of taking out a Bone Griffon fleet. First time I've played against them but I had already heard about their perceived deadliness at range. 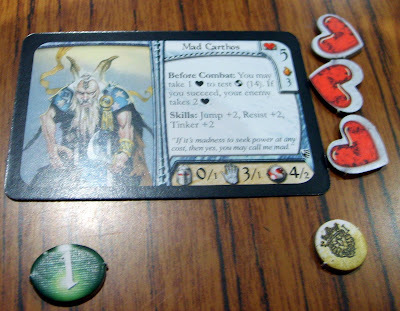 Also no Star Cards in this game which knocked back the elves due to the negation of their magical trickery. with the 'bad guys' winning initiative and moving first. Fortunately all the troublesome Orcas were placed on one side with an island separating them from the rest of the fleet, so I had a pretty much unobstructed path towards the cruisers and the rock chucking battleship with my own cruisers and frigates, and the bonus of a couple of isles to shield my battleship as it moved forward. risking going out of control radius. Didn't have to worry to much about being out of command as the lead cruiser soon slide beneath the waves. The other cruiser was soon decrewed as well. After a disastorous ramming attempt by three Orcas, that resulted in them getting wiped out, I finally managed to get my battleship in close range of his. Since it was an all trebuchet layout I had only the plague gun to worry about. Even with some crew damage my ship was still able to put 14 dice of shots into the undeads ship. The opposing player was a bit disappointed that he didn't get both the trebuchet and broadside dice to play with, if he had known I don't think he would of been so keen to bring it so far forward. I don't recomend the Bones for a first time player, too many extras to take into account, best to get the basics nailed first. speed bump frigate to stop his turn. Some how the opponent managed to get his battleship stuck against the edge of the world and my frigate effectively locked it in place for a turn. With his one remaining cruiser sailing away and being harassed by my other remaining frigates, and his other squadron of Orcas being dealt with by the neighbouring dwarfs there was no rescue for the big ship. 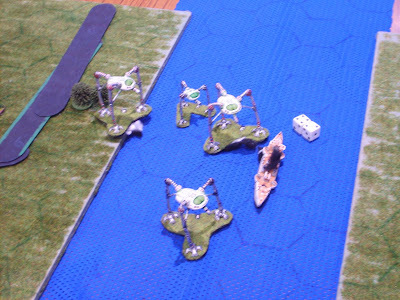 And with time running out and people having to run off, the game was declared as a narrow good guy victory, primarily due to the taking out two of the bad guys battleships in the final turn. I didn't feel too hot so decided to sit out and watch a few games instead. 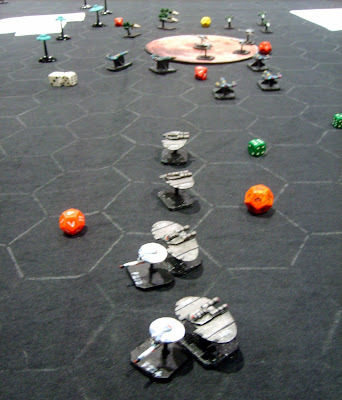 Martin had brought along his spaceships and was organising a game of his still unreleased DTS rules. These rules have been in various stages of development for over 5 years now and are based on an original idea by Paul. Unfortunately he had forgotten the fleet record sheets so had to reuse some existing ones. There is actually over 20+ fleets to select from, but given that most are derived from well known TV shows it's doubtful that anything would get published. A close game with Colin just being shaded out. A collision between his own ships might of been a deciding factor. The players were suitably impressed that they requested further games. 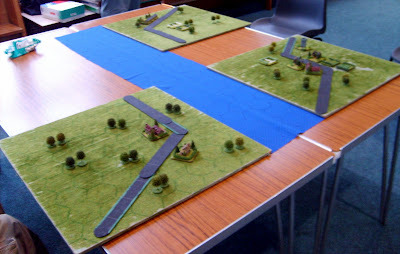 Also at the club a GQ3 WW1 game was under way with a battle between the German and Russian navies in the Baltic. 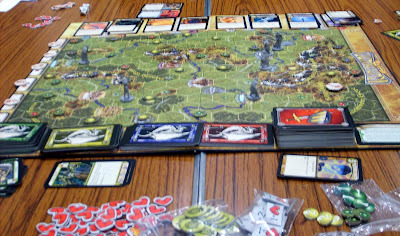 A couple of games of 40K and a single WH fantasy game, plus the usual role-players and a table of Card gamers. A modern day home-brew conversion of the original G.E.V. from Steve Jackson Games. India vs Pakistan in the 60's. Got to command some Shermans for the Pakistanis, which surprisingly was not the worse armour in the battle. With no overwatch available and with weaponry not affected by range the numerically superior and better equipped Indians could standoff and blast at a distance. All I could do was replenish the depleted forces in the buildings. 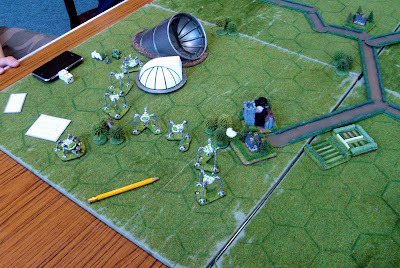 The other, right, flank collapsed early as the armour went head to head in fairly open ground. Losing our Forward Observers early didn't help much to stop the enemy advance. We just managed to hold on till our reinforcement's arrived, but they soon disappeared into a cloud of smoke and wreckage. Not a very balanced scenario. 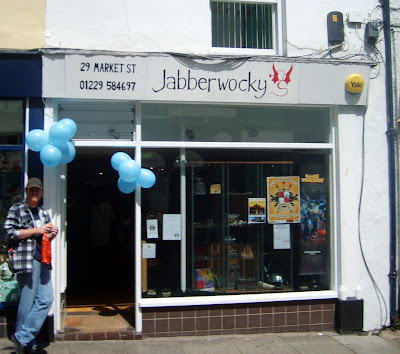 A quick visit to Jabberwocky Games to check if they had the Thaniras War Dragon available for Uncharted Seas. Managed to purchase one; now I've got to work out how to paint it. Might co-ordinate it with the rest of my unconventional purple coloured elven fleet. 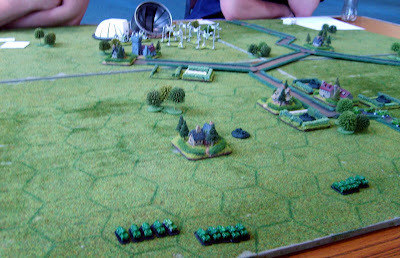 Phil was involved in a big Flames of War eastern front game taking up the entire main table. Looks like the shelves are slowly filling up with stock as more new lines come in. Got delivery of the new edition of Britannia and boy are the components sweet. Well worth the £25, full colour map and counters, and nicely layout rule book with pictorial examples. Overall a big improvement on the Gibsons Games presentation. Minor quibbles about it include the lack of tribe names on counters (each has its own unique picture\emblem on) and the fact that the inlay tray in the box seems to be from another game! there just isn't enough room for the components once they been punched out. Also this week: The ongoing Irish campaign came to a conclusion at the Wargames, with Tel O'Malley becoming High King of All-Ireland (barring the bits the Normans have). After many skirmishes between the rival claimants it came down to a meeting of all nobles to decide democratically upon the king. This didn't work as planned as the ensuring stalemate descended into an all out fight. O'Malley becoming King due to the principle of last man standing. Another Campoon map turn, and with Martin absent the Nurgles headed for a wipeout as all three of his 'friendly' neighbours ploughed into them. Mark has withdrawn to his island in preparation of him being missing the next few weeks. His position on the mainland was pretty much untenable now. Paul seems to think he in a good position but his capital is vulnerable to a quick march from Matt. Even I could get there unmolested but I don't have the strength to take it so I have been harrasing Dave's borderland from my new base. If Matt goes into Paul's territory I'll might go raiding there instead. 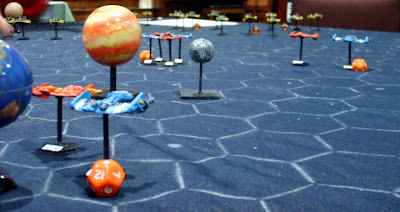 Those pesky martians are at it again, as we play another test of Paul's combat system, this time on a larger board. 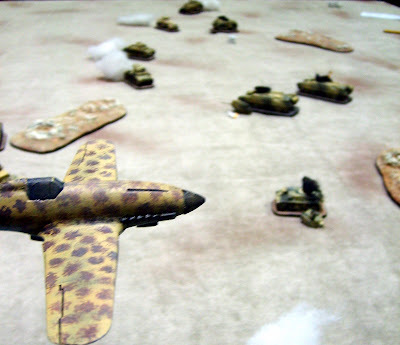 An initial Martian landing force verses some Armoured Cars and fixed gun positions. A strange object lands in the green and pleasant land. Mobile (for turn of the 20th Century) troops are sent to investigate as artillery digs in 'a safe distance' away. The object opens up and disgorges a number of strange machines. The cars pay an heavy price as the Martians destroy everything in their path (including hostile trees and churches). But what they don't spot till too late is a sneaky detachment of cars circling behind. The sneak attack pays off and the Martian forward base is destroyed even as the cars turn to molten slag. 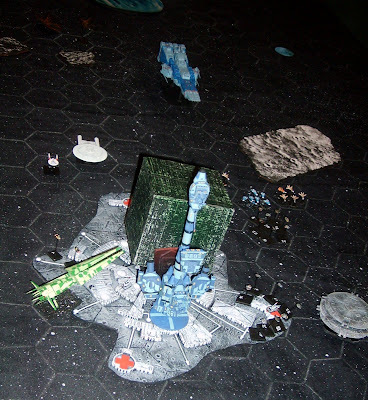 With their Command Post destroyed the Martians could not win, but they could earn a draw by destroying the British command post which was protected by the artillery. This the Martians did quite easily using their superior weaponry. 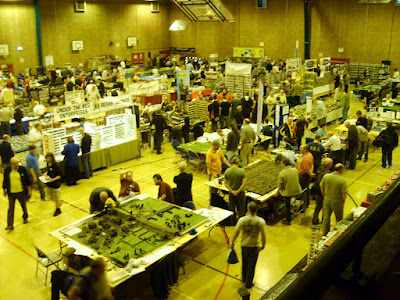 Phalanx, the North-west premier wargames show was once again held at St Helens. Not too bad a drive, wet in places but still made good time. Did have to drive around St Helens a bit to try and find the route to the Centre. It didn't seem as well signposted as past years. Seemed a bit quieter than last time, with less traders and more room for the demo games. 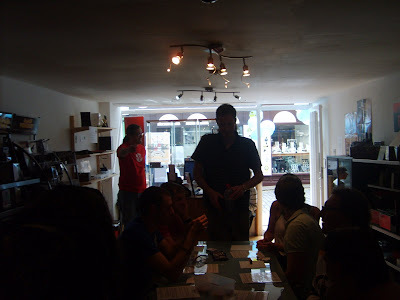 There also didn't seem to be any boardgame traders other than the second-handers. The bring and Buy was also a bit thin of items, only a couple of things perking my interest. Martin was demoing his Anglo-Dutch Naval rules, doing his largest battle to date (Goodwin Sands\Dover) and aided and abetted by Graeme, who had managed to purchase some more Uncharted Seas stuff, despite its scarcity, in his continuing quest to defeat Colin's Dwarf Fleet. 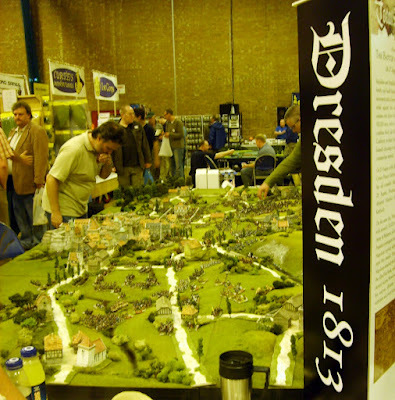 A couple of demos caught my eye, a Sudan fight, and a very impressive Dresden demo. Didn't purchase much myself, just some 15mm Abyssinian Riflemen from Irregular Miniatures to help bulk up my army and a copy of the latest Battlegames magazine. So not as eventful as past years but still a decent way to waste a few hours on a Saturday. No Campoon this week so just a quick play test of some ancient rules downloaded by Paul. These are quite complex by Paul's usual standards as they spanned over two A4 pages rather than the one sided rules he's more familiar with! 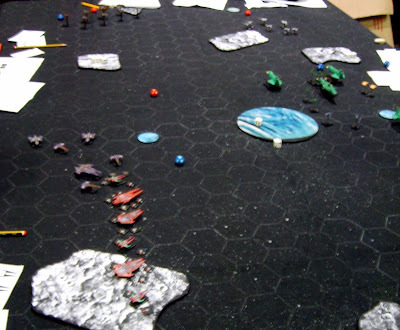 An hex based system with simple army lists and a quick play mentality, the idea behind the test being to find a set that was simple and quick for use in future campaigns, the lack of expertise in Warhammer Ancients currently being a bit of a dampener in the current Campoon, as people avoid combat or use the table resolution mechanism instead. A simple battle, Romans vs Barbarians\Misunderstood Culture. 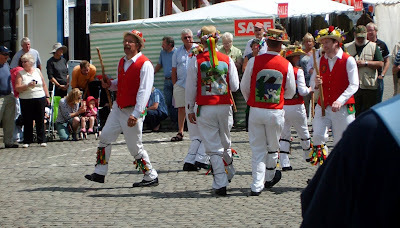 Four players taking half a sides forces each. Matt the Romanophile and Dave S vs Me and Paul the Geordie Barbarian. With only one set of rules it was mostly taught verbal, and a few mistakes were made, but they were a quick set to pick up and everyone seemed to enjoy it. 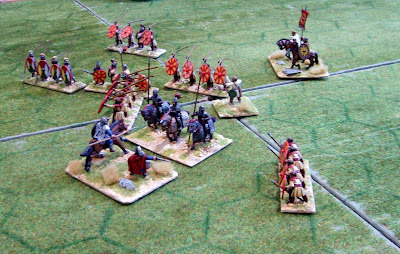 The Romans had stronger forces than the Baa-Baas and despite manging to hold my flank we were eventually overwhelmed. 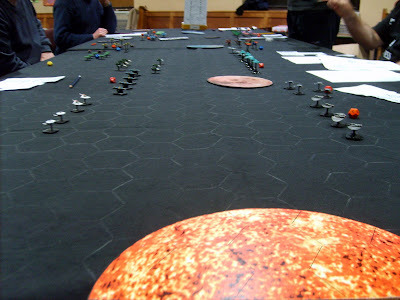 After that it was time to test some more rules, this time Paul's home brewed 'War of the Worlds' campaign rules. Based on one of the recent movies (not the Tom Cruise bore fest.) it has more of a World War One feel about it - War Machines vs Tanks and Armoured Cars. 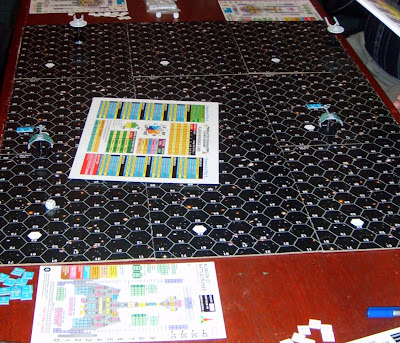 Very much a game in development, the campaign element involves transport between small battle boards and the protection of factory elements as both sides try to gain the upper hand. The Martians by building more war machines, the Brits by mass producing tanks and guns. Only four battle maps involved this time but I believed that its planned for a much larger campaign map. 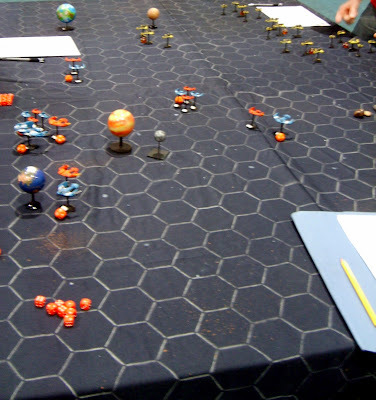 The Brits won the first battle vs Martian scouts, mostly due to the help from the Navy, but in the second battle the tables were turned as proper War Machines started coming off the production lines.